Basil doesn't seem to like it when I have the laptop on my lap. He comes right over and steps on it and sniffs around. 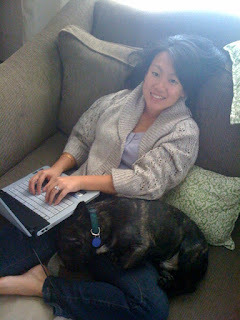 I know what he wants...he wants to lay on my lap and the laptop is taking up some of his valuable real estate. So now I move one leg out for him to lay on and type on my laptop side ways. If that ain't love I don't know what is. I have never in my life seen a dog so loved. Makes my heart swell knowing I had a part in finding him such a loving and perfect home.